In the context of M&A transactions, we provide advice to our clients in corporate acquisitions, disposals, MBO processes and joint ventures. We offer you continuous advice throughout the entire transaction process – the analysis of the available options, the determination of the deal strategy and deal structure, the search and selection of the appropriate transaction partners as well as the due diligence. We assist our clients starting from the negotiation phase up to the signing of the purchase agreement. In addition, we are provide project management services throughout the deal execution. Clients can rely on our long-lasting transaction experience, our industry expertise and our well-developed network. 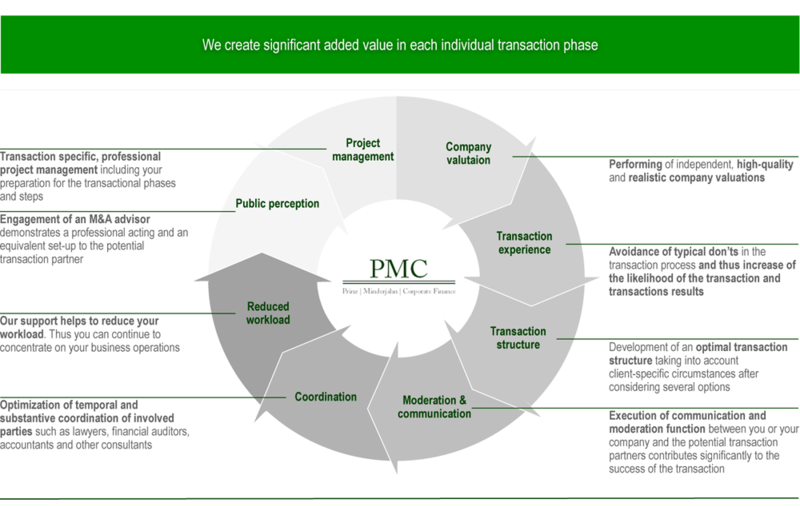 In each transaction phase the involvement of PMC creates significant added value for you and contributes to the overall success of the transaction.